AdRep Online is a dedicated sales CRM portal for your sales team. AdRep Online shares its database with AdSystem ensuring everyone in your organization is on the same page. AdRep Online is cloud-based and accessible using any browser, computer, tablet, or smartphone with internet connection. 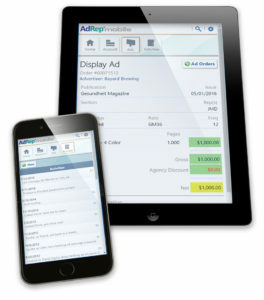 AdRep Online includes AdRep Mobile which is optimized for smartphones, ensuring that your sales team stays connected at all times and places. 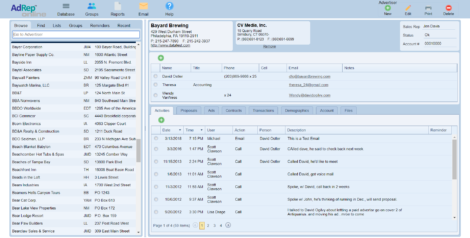 AdRep Online is a dedicated CRM portal to AdSystem. AdRep Online may be accessed using any browser running on any computer, tablet or smartphone. AdRep Online provides your sales staff with access to live AdSystem data with all the CRM tools they need to be productive and effective. Have mobile access to AdSystem’s database anywhere and anytime with AdRep Mobile, the CRM designed for smartphones and mobile devices. It is time to enhance your communication and overall performance with advertisers. Acquire the competitive edge with AdRep Mobile to easily monitor sales performance, check and order information, and log activities anywhere you have an internet connection.